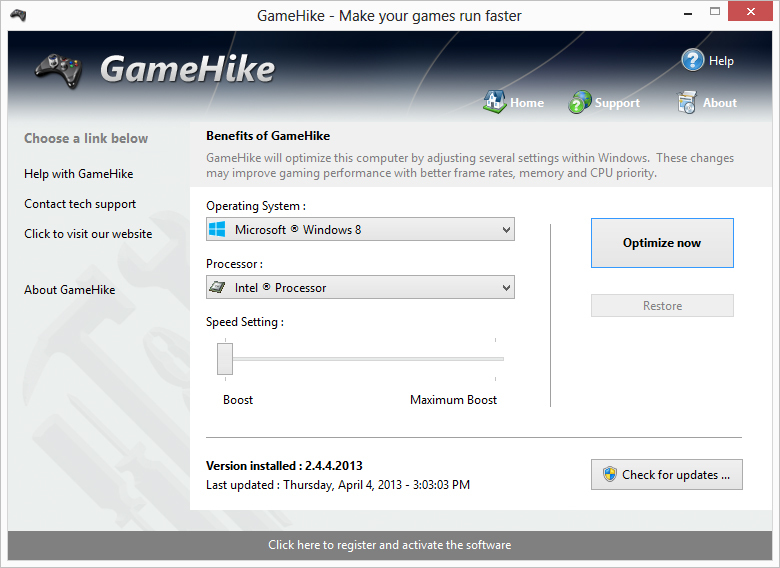 GameHike is a tool for all that allows you to modify your computers settings to increase gaming performance. No modifications to your hardware are made and all adjustments and settings are done in an easy to use interface that a child could use. No more frame rate glitches or slow downs can be achieved by using GameHike with your favorite games. GameHike has been tried and tested and proven to work. Are you tired of playing your favorite game only to find your computer isnt fast enough any longer? Or are you sick of games crashing because of not enough available resources? GameHike not only fixes these errors from occurring it also enhances your computers gaming performance. Speed up your Windows environment with this tool, while fixing errors that are in the way of your gaming.